One of the most controversial U.S. presidents, Lyndon Baines Johnson rose from obscurity to the pinnacle of power, only to suffer disillusionment and defeat. 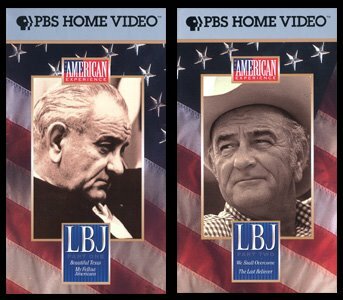 Witness the events that brought LBJ from Texas to Washington, the White House, and a landslide election in 1964. Follow his triumphs in passing passes a wave of social legislation. Then, as war and civil turmoil ravage the country, his downward spiral ends in withdrawal from politics. "LBJ, Lyndon Baines Johnson -- Texan, Democrat, political virtuoso. He rises up out of the 1960s like a Colossus, like something from Shakespeare, filling the stage -- 10, 12 characters in one. He is admired and he is detested. Everybody who knew him had stories. Yet Lyndon Johnson was hard for the country to know. He seemed so stiff and colorless on television, not at all himself. The real Lyndon Johnson was a mover, a driver, a charmer, a bully -- six feet four inches tall with a size 7-3/8 Stetson hat. He loved food -- chili and tapioca pudding. He loved attractive women. He was a good dancer, a brilliant mimic. He was funny, often hilarious. They all say that. But the real measure of a leader is what he gets done, the size of the problems he faces. Before Lyndon Johnson, we were essentially a segregated society. Inequality among black Americans in the South was set in law. Before Lyndon Johnson, there was no Head Start program, no Medicare -- so much that we take for granted -- and before Lyndon Johnson, very few Americans had even heard of Vietnam. He is a story, a very American story and, in all, a tragedy in the real sense. He's the central character in a struggle of moral importance ending in ruin. "